The rapid pace of development in contact lens technology over the past 10 years has made lenses a genuinely viable alternative to spectacles for the vast majority of people. Some people like to wear lenses occasionally – for example, when playing sports or on special occasions – whereas for others they are a way of life. 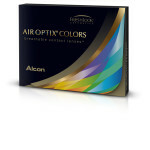 Whatever your needs, we can provide the lens and package most convenient for you. At Thie Optometrists, fit all of the leading brands of contact lenses and during your consultation, our optician will ascertain which types of lenses would be best suited to your individual requirements. Amongst the factors to be considered are your prescription needs (for example, single vision, bifocal or varifocal), your working environment and your lifestyle (e.g. any hobbies, or sports you may be involved in). Contact Lens wearers must have regular eye exams as advised by their optometrist, usually once a year. Always keep a pair of spectacles with your current prescription available with you, to allow your eyes occasional rest from contact lens wear or should an unforseen emergency arise. Contact lenses are a viable alternative to spectacles for many children if they are well motivated. They are particularly useful for sports, dance, and drama, and can provide a boost to the child’s self esteem. Both hard and soft contact lenses can be fitted at Thie Optometrists. Thie Optometrists also fit & supply coloured contact lenses. Coloured contact lenses are available for both prescribed and non-prescribed versions (for those who do not require any optical correction). 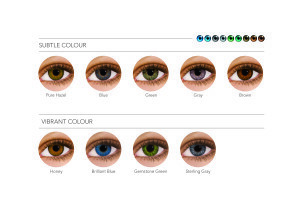 We normally stock a wide range of coloured contact lenses from a number of manufacturers in our branches. Warning all contact lens patients about the risks of swimming and showering. There has been an increased incidence of Acanthamoeba keratitis. An eye infection caused by an amoeba, found in soil, swimming pools and stored water. Although still very rare, it is devastating, very painful, often misdiagnosed initially, difficult to treat, and can lead to severe corneal scarring and vision loss. Always avoid swimming and showering in your contact lenses. This organism is more common in UK where we store water in tanks, rather than take it directly from the mains, as in other countries. It is also more common in hard water areas. 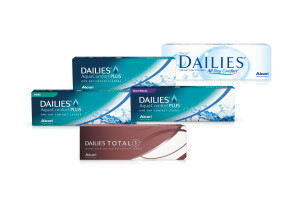 If you would like to order or enquire about contact lenses online – please click here.